Since I’ve been trying to cook more with local, seasonal produce,I’ve been experimenting with some fruits and vegetables I’d never used before. Some I’d never even heard of in Australia – like jicama, okra, shallots (we call scallions shallots, and I haven’t seen these small sweet onions at all in Oz). Some I’d only ever read about or seen dried, tinned or packaged – cranberries, persimmon, chestnuts. Inspired by the gorgeous blog Apartment 2B Baking Co (be sure to follow the link and marvel at the delicious goodies Yossy bakes, styles and photographs so beautifully in her tiny kitchen), I decided to experiment with quince as dessert for a dinner party a little while ago. The menu for the night was going to be quite festive and heavy, so I wanted a dessert that was pretty and fruit-sweet without being too decadent. 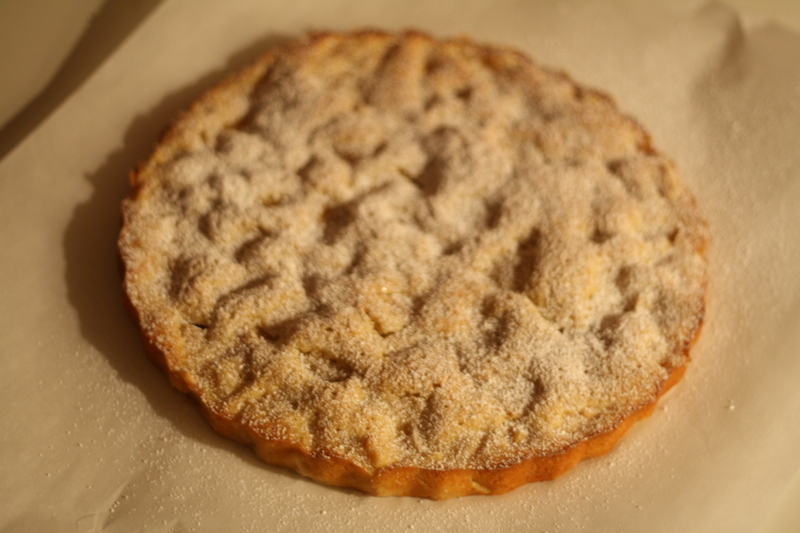 Yossy’s Quince Custard Cake sounded perfect – fragrant quince poached to tenderness, enfolded in a light cake that’s crispy at the edges and custardy in the centre, not to mention the crunch of demerara sugar on top and a dusting of icing sugar. The only change I made to the original recipe was to bake it in my wide tart dish – only because it’s all I have and I was too tight to invest in a cake tin. I worried the tart dish would be too big, but the cake rose some and ended up quite a nice thickness, not too intimidating for our mostly-full tummies! The cake popped out of the pan just fine, and I quite like the fluted edge for presentation. 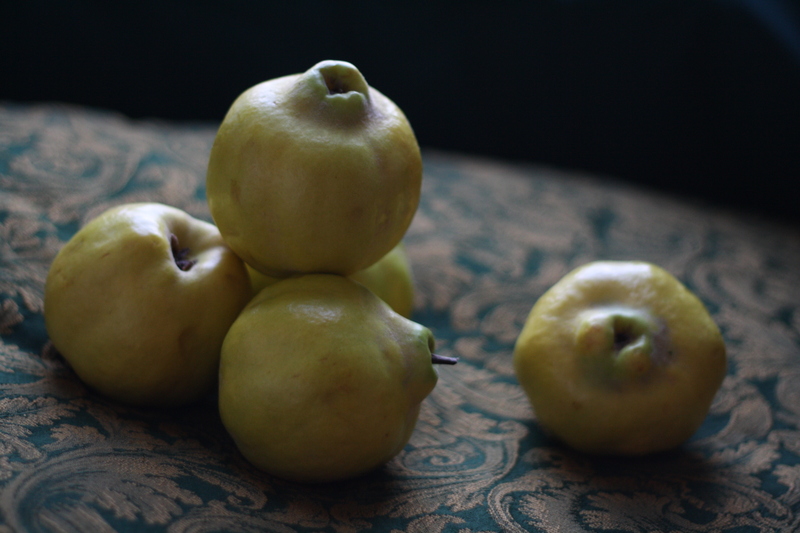 There’s something romantic about quince. It’s somewhere between apple and pear in flavour, although the flesh is so hard you could never eat a quince without cooking it first. The skin is hard, sometimes with a little fuzz, and the fruit have this exquisite fragrance that has to be sniffed to be believed! They’re a little knobbly, but noble, almost medieval in appearance – a photogenic fruit to be sure. But once you’ve instagrammed your bowl of quince, and let them perfume your kitchen a while, it’s time to get down to business. Original recipe from Apt 2B Baking Co, here. Preheat oven to 350F (175C), butter an 8 or 9 inch round tin and line with baking paper. Whisk together dry ingredients (flour, baking powder, salt) in a medium bowl. Whisk together eggs, sugar and vanilla in a large bowl until foamy, then add poaching liquid and melted butter. Fold the flour mixture into the wet ingredients, then the chopped quince. Pour into the baking tin, smooth the top and sprinkle with crunchy sugar. Bake for 50 minutes or until a knife inserted into the middle comes out clean. Cool completely in the pan, dust with sifted icing sugar and serve with cream or crème fraiche if you like. Peel, core and cut each quince into 8 wedges. Combine sugar and water (and wine, if using) in a medium saucepan over medium heat, until sugar dissolves. Then add lemon, orange zest, vanilla and quince, and stir to combine. Bring to a simmer and cook until the quince are soft enough to poke with a fork, but not too mushy. It could take 20-40 minutes depending how ripe your quince are. You can store the quince in their syrup until you’re ready to use them – the drained syrup is good for fancy cocktails, apparently! 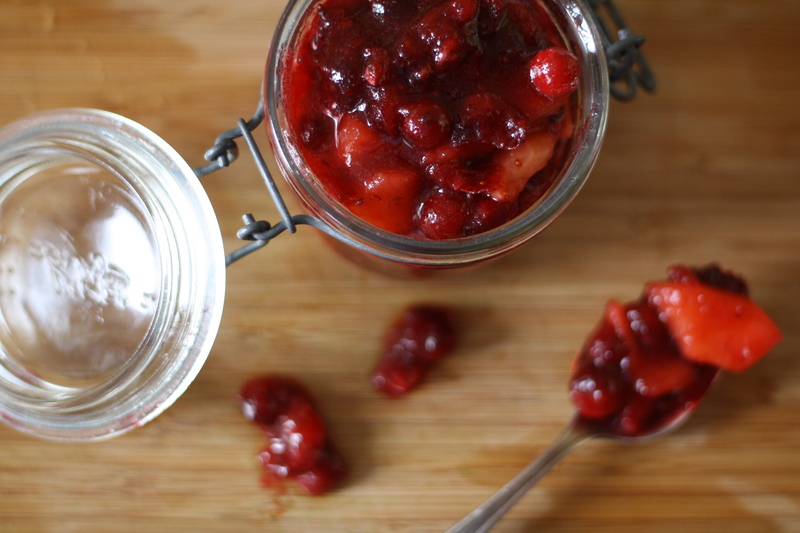 I used my leftover quince to make a cranberry-quince relish inspired by a holiday-themed dinner I helped out with at Sunday Suppers. Rinse and drain the cranberries. Place them in a small, heavy saucepan with the sugar and vinegar. Simmer over medium heat, stirring occasionally to prevent sticking, until the berries are bright and soft and gooey. Remove from heat and fold in quince. Once cooled, store in jars.